latias_latios_7 has 445 positive feedback, 0 neutral feedback and 0 negative feedback, for an overall percentage of 100% positive feedback. Positive feedback from lupineradiance on Thu, 26 Oct 2017 13:11:36 -0500: I bought from latias_latios_7. Positive feedback from lycanrocs on Sun, 13 Aug 2017 13:17:18 -0500: I bought from latias_latios_7. second time buying, a pleasure as always :-) bought some sleeves, everything is great. thanks! Positive feedback from stormblazepony on Wed, 9 Aug 2017 03:10:40 -0500: I bought from latias_latios_7. bought ninetales card sleeves. Very fast shipping and dispatch. thank you! Positive feedback from poliwhirl on Wed, 9 Aug 2017 00:58:09 -0500: I traded with latias_latios_7. Positive feedback from lycanrocs on Fri, 28 Jul 2017 20:07:57 -0500: I bought from latias_latios_7. Sent quickly!! latiaslatios was very nice and the sleeves i bought are great :D thanks!! Positive feedback from magearna on Fri, 30 Jun 2017 08:47:18 -0500 for this transaction: I bought from latias_latios_7. Positive feedback from sparkmongoose on Wed, 28 Jun 2017 22:24:58 -0500 for this transaction: I bought from latias_latios_7. I bought some PTCGO code cards, which were shipped promptly. The seller was very easy to work with, would buy again. Positive feedback from missdizzzy on Thu, 22 Jun 2017 16:35:10 -0500: I sold to latias_latios_7. Positive feedback from missdizzzy on Thu, 22 Jun 2017 16:30:36 -0500: I traded with latias_latios_7. Positive feedback from legendaryluna on Sat, 3 Jun 2017 08:51:17 -0500: I sold to latias_latios_7. I sold an abra plushie! This user is super kind! Welcome back anytime! Positive feedback from godudette on Thu, 23 Mar 2017 18:16:30 -0500 for this transaction: I traded with latias_latios_7. Positive feedback from sweetiesylveon on Sun, 19 Mar 2017 16:24:06 -0500 for this transaction: I bought from latias_latios_7. I bought a 100 card lot of classic cards from them. Thanks! Positive feedback from silverinfinity on Sat, 11 Mar 2017 04:11:58 -0600: I bought from latias_latios_7. Bought a MCharizard card. Arrived super fast, thanks! Positive feedback from j_ule on Wed, 8 Feb 2017 07:13:27 -0600: I traded with latias_latios_7. Positive feedback from deranged_girl on Tue, 7 Feb 2017 17:57:10 -0600: I traded with latias_latios_7. Positive feedback from britt_san on Mon, 6 Feb 2017 00:17:35 -0600: I bought from latias_latios_7. Received my card lot today! They're all amazing and the seller was so lovely to do business with! 10/10 seller! Would do business with again! Positive feedback from dragoniter on Tue, 31 Jan 2017 15:19:07 -0600: I traded with latias_latios_7. Traded some art for some sprites! Good person and very nice even after my little mistake I didn't know haha. Positive feedback from shurari on Mon, 12 Dec 2016 16:49:58 -0600: I bought from latias_latios_7. I bought 8 perler sprites; they arrived really fast and look amazing! I would buy again. Thanks so much! Positive feedback from methuselah31010 on Thu, 1 Dec 2016 12:54:36 -0600: I bought from latias_latios_7. Fast turnaround like always! Thanks so much! Positive feedback from vulpes_canis on Tue, 29 Nov 2016 18:23:23 -0600: I sold to latias_latios_7. Latias, commissioned 2 simplified plushies from me, they followed all of my rules and were a delight to work with :) Enjoy your plushies! Positive feedback from lordnovember on Thu, 20 Oct 2016 19:59:10 -0500: I bought from latias_latios_7. Positive feedback from vulpes_canis on Sun, 2 Oct 2016 15:23:37 -0500: I sold to latias_latios_7. Positive feedback from ashlilyneko on Sun, 2 Oct 2016 03:07:33 -0500 for this transaction: I bought from latias_latios_7. Bought two Sylveon EX cards. packaged relatively well, would maybe recommend a ziplock for cards sent in envelopes, but they arrived safe either way. Cards were in great condition, exactly as described! Thanks so much, they're adorable! Positive feedback from youngsterxjoey on Fri, 2 Sep 2016 22:43:50 -0500: I traded with latias_latios_7. Positive feedback from jarshaarashi on Mon, 29 Aug 2016 22:18:33 -0500: I traded with latias_latios_7. I traded my Mega Charizard EX card for her Flareon EX card, along with some miscellaneous cards. She shipped them quickly and made sure they were well protected. Thank you! Positive feedback from nerd on Tue, 23 Aug 2016 21:52:17 -0500: I bought from latias_latios_7. Positive feedback from kyogres on Tue, 23 Aug 2016 14:22:09 -0500: I traded with latias_latios_7. I traded some TCG cards with latias_latios_7. Good communication and my half of the trade arrived quickly. Thanks. Positive feedback from rebekahraichu on Tue, 23 Aug 2016 14:07:39 -0500: I traded with latias_latios_7. I traded cards with her. She was super friendly and it arrived quickly. Thanks! Positive feedback from magmanerd on Wed, 29 Jun 2016 08:51:18 -0500: I traded with latias_latios_7. Awesome person, trade went smoothly and I received the cards quickly and in perfect condition. Positive feedback from mlle_chantilly on Sun, 26 Jun 2016 07:06:26 -0500 for this transaction: I bought from latias_latios_7. Positive feedback from butterfreeboy on Sat, 25 Jun 2016 10:04:05 -0500: I bought from latias_latios_7. Positive feedback from shadowpokgengar on Tue, 31 May 2016 18:14:04 -0500: I traded with latias_latios_7. Positive feedback from sparkmongoose on Sat, 30 Apr 2016 15:30:08 -0500 for this transaction: I bought from latias_latios_7. Bought some PTCGO codes, great communication and fast shipping! Positive feedback from deadbomb on Fri, 29 Apr 2016 22:27:53 -0500 for this transaction: I bought from latias_latios_7. I bought a custom perler bead commission (Pink Drifloon! ), and it turned out awesome! Fast transaction, great communication. I would buy form this user again. Positive feedback from solishark on Fri, 15 Apr 2016 11:31:32 -0500: I bought from latias_latios_7. Positive feedback from 2fat_free on Thu, 14 Apr 2016 22:08:20 -0500: I bought from latias_latios_7. I bought a paper-craft type kyurem thing from this user. AMAZING PRICES!! GREAT ITEMS!! FAST, HONEST, AND ORGANIZED. A GREAT SELLER!! Positive feedback from vulpes_canis on Thu, 10 Mar 2016 11:03:00 -0600: I sold to latias_latios_7. Latias_latios_7 commissioned 2 simplified plush from me. They followed all of my rules and waited patiently for their plush to be made! Positive feedback from emolga on Mon, 7 Mar 2016 22:34:40 -0600: I bought from latias_latios_7. I bought a pokemon origami book from them, and it arrived safely and quickly! Thank you so much! Positive feedback from pikabulbachu on Tue, 23 Feb 2016 16:48:24 -0600: I bought from latias_latios_7. Positive feedback from umbreyena on Thu, 18 Feb 2016 14:37:41 -0600: I bought from latias_latios_7. Positive feedback from chromapika on Tue, 16 Feb 2016 13:48:03 -0600: I bought from latias_latios_7. Positive feedback from starrypurrloin on Mon, 15 Feb 2016 16:19:29 -0600: I bought from latias_latios_7. Positive feedback from spritzzie on Sun, 14 Feb 2016 21:54:21 -0600: I bought from latias_latios_7. Latias_latios_7 helped me out by being a middle man for some McDonald's toys synysterxskittl got for me! Everything arrived well protected, and I couldn't be happier! Thank you so much! Positive feedback from raymence on Thu, 4 Feb 2016 15:35:11 -0600 for this transaction: I bought from latias_latios_7. Positive feedback from schenzi on Tue, 2 Feb 2016 12:39:51 -0600: I bought from latias_latios_7. I commissioned a v-day sprite from latias_latios_7 and they also acted as a middleman for a mcdonalds groudon figure. Positive feedback from deranged_girl on Mon, 1 Feb 2016 14:10:15 -0600: I bought from latias_latios_7. Positive feedback from pikabulbachu on Fri, 29 Jan 2016 17:02:24 -0600: I traded with latias_latios_7. Positive feedback from thedaftlynx on Mon, 11 Jan 2016 14:02:36 -0600: I bought from latias_latios_7. Positive feedback from poliwhirl on Tue, 22 Dec 2015 19:53:15 -0600: I sold to latias_latios_7. Took part in my sleeping figures XY3 sets pick up. Payment was sent promptly after I have the details up. Thanks! Positive feedback from faleepai on Tue, 22 Dec 2015 16:44:24 -0600: I traded with latias_latios_7. Traded a May card and some kid figures for a BW pocket comics book. Shipping was fast! Thanks so much! Positive feedback from moonliteumbreon on Thu, 10 Dec 2015 15:43:52 -0600: I bought from latias_latios_7. Positive feedback from dokina_abetara on Mon, 7 Dec 2015 00:13:25 -0600: I bought from latias_latios_7. Positive feedback from aslyl on Sat, 28 Nov 2015 20:12:04 -0600: I bought from latias_latios_7. Positive feedback from j_ule on Sat, 28 Nov 2015 12:59:38 -0600: I sold to latias_latios_7. I sold a Phantump custom plush and got payment promptly :) Thanks so much for the purchase! Positive feedback from lulupin on Wed, 28 Oct 2015 05:44:26 -0500: I bought from latias_latios_7. Positive feedback from mercurrix on Mon, 5 Oct 2015 21:00:31 -0500: I bought from latias_latios_7. Positive feedback from diamondphantom on Wed, 30 Sep 2015 20:16:01 -0500: I traded with latias_latios_7. Positive feedback from diamondphantom on Wed, 30 Sep 2015 20:15:08 -0500: I participated in a GA with latias_latios_7. Positive feedback from eeveefruit on Mon, 28 Sep 2015 11:24:44 -0500: I sold to latias_latios_7. Positive feedback from starpurrloin on Sun, 27 Sep 2015 11:42:48 -0500: I bought from latias_latios_7. Positive feedback from cardwhale on Sun, 27 Sep 2015 11:13:39 -0500: I sold to latias_latios_7. Dusky/Sableye Mystery Dungeon figure sold. Paid right away in 2 payments. No problems at all! Thank you so much! Positive feedback from hollyasevenx on Sun, 27 Sep 2015 07:02:22 -0500: I bought from latias_latios_7. I commissioned a cute little picture of Umbreon and Jolteon and it's adorable! It's on the wall with another Umbreon pic someone drew for me. Thank you so much and I appologize for the late feedback! Positive feedback from mystica15 on Sat, 26 Sep 2015 15:11:54 -0500 for this transaction: I bought from latias_latios_7. Positive feedback from icyshadowblades on Sat, 19 Sep 2015 13:50:05 -0500 for this transaction: I participated in a GA with latias_latios_7. Participated in at TFG GA - everything went smoothly. Thanks! Positive feedback from skdarkdragon on Fri, 11 Sep 2015 14:53:34 -0500: I sold to latias_latios_7. Positive feedback from bulbybulbasaur on Sat, 29 Aug 2015 00:16:53 -0500: I bought from latias_latios_7. Positive feedback from leonibba on Mon, 24 Aug 2015 13:18:05 -0500: I bought from latias_latios_7. I won a mareep pokemon box charm mip and a mega ampharos pokemon box charm mip. Super happy and satisfied with both. Fast shipping. Will gladly work with again!! Positive feedback from milkshayke17 on Fri, 21 Aug 2015 21:13:24 -0500: I bought from latias_latios_7. I bought a signed Keldeo perler sprite from this user and I am very happy and completely satisfied with the transaction. The user was extremely accommodating and I deeply appreciate their kindness. The shipping was very fast and the rate was great, too. I would definitely do business with this user in the future! Thank you! Positive feedback from dubslider on Thu, 20 Aug 2015 17:43:33 -0500 for this transaction: I bought from latias_latios_7. I bought a set of sprites for them. For the most part (a hiccup on my end), communication was fabulous and the sprites (although a tad curled) still look AMAZING and I am in love with them. Thank you so much!! Positive feedback from bulbybulbasaur on Thu, 20 Aug 2015 15:51:56 -0500: I traded with latias_latios_7. Positive feedback from marphoria on Tue, 18 Aug 2015 08:22:12 -0500: I participated in a GA with latias_latios_7. Participated in a TFG GA! Communication was great, and items were packaged well! Great host, thanks so much! Positive feedback from haepbrosonearth on Tue, 18 Aug 2015 01:31:11 -0500: I participated in a GA with latias_latios_7. Positive feedback from zigguppafu on Mon, 17 Aug 2015 16:56:05 -0500: I participated in a GA with latias_latios_7. Positive feedback from coiffwaff on Mon, 17 Aug 2015 13:57:56 -0500: I participated in a GA with latias_latios_7. Practiced in a GA that was hosted by Latias_latios_7. Item arrived in great condition. Thank you so much! Positive feedback from tyltalis on Mon, 17 Aug 2015 09:21:07 -0500: I participated in a GA with latias_latios_7. I won a TFG GA, my figure came packaged safely and arrived super fast. c: Thank you for hosting this GA! Positive feedback from marthmellow on Mon, 17 Aug 2015 01:58:28 -0500 for this transaction: I bought from latias_latios_7. I bought a V-day sprite from her, and I absolutely love it. Also, she was really patient, nice, and understanding, resolving any problems quickly. Positive feedback from hanteninuyasha on Sun, 16 Aug 2015 23:09:18 -0500: I bought from latias_latios_7. I bought a set of eeveelution perler sprites from this lovely lady. They came packaged well and I love them! It's my third time ordering from her and I will absolutely order from her again. Thank you for all your hard work! Sorry for leaving feedback so late. Positive feedback from meowsticwarrior on Sun, 16 Aug 2015 01:26:26 -0500: I traded with latias_latios_7. Positive feedback from luckymissclover on Sat, 15 Aug 2015 23:48:57 -0500: I traded with latias_latios_7. Positive feedback from synysterxskittl on Fri, 14 Aug 2015 16:32:16 -0500: I bought from latias_latios_7. Positive feedback from polahbear on Wed, 12 Aug 2015 22:38:25 -0500: I sold to latias_latios_7. bought an arceus pokedoll from me and paid quickly, thank you! Positive feedback from plushlosophy on Wed, 12 Aug 2015 20:11:36 -0500: I traded with latias_latios_7. We traded art! Great communication and cute drawing. Thanks so much! Positive feedback from pkmnexcavation on Thu, 6 Aug 2015 16:25:11 -0500: I traded with latias_latios_7. Positive feedback from anti_pineapple on Wed, 5 Aug 2015 21:50:18 -0500 for this transaction: I participated in a GA with latias_latios_7. Positive feedback from pikachux on Wed, 5 Aug 2015 17:37:02 -0500: I sold to latias_latios_7. Positive feedback from anaildapinto on Wed, 5 Aug 2015 17:21:57 -0500: I sold to latias_latios_7. She commissioned me keychains in three distinct occasions with easy and fast answer! Thank you very much for all the purchases and hope to be useful for your service again! Positive feedback from moonliteumbreon on Tue, 4 Aug 2015 23:50:20 -0500: I bought from latias_latios_7. Positive feedback from ap_kun on Tue, 4 Aug 2015 02:32:50 -0500 for this transaction: I participated in a GA with latias_latios_7. Very nice ga host, protected package well! Positive feedback from guccishiny on Mon, 3 Aug 2015 22:15:46 -0500: I participated in a GA with latias_latios_7. I got 2 TFG Rayquaza & Scyther from a GA, co-hosted by the user. She communicated quickly, clearly, and shipped the items well-packed. I got the items in no time after the notification! Will definitely participate in any activities from the user and thank you so much with my "Green" collection :) !!! Positive feedback from clicky797 on Sun, 2 Aug 2015 13:45:39 -0500: I participated in a GA with latias_latios_7. Positive feedback from clicky797 on Sun, 2 Aug 2015 13:44:47 -0500: I bought from latias_latios_7. Positive feedback from chain on Tue, 28 Jul 2015 05:48:04 -0500: I bought from latias_latios_7. Bought a personality perler sprite, which was shipped out fast. Thanks! Positive feedback from pepperzark on Sat, 25 Jul 2015 11:34:47 -0500: I bought from latias_latios_7. I bought a personality sprite. It was a really cute thing to do, thanks. Positive feedback from raymence on Fri, 24 Jul 2015 13:15:25 -0500: I bought from latias_latios_7. I bought a perler sprite. It was created and sent quickly and arrived well. Since it was a surprise which sprite you'd get it also was a fun experiment. Thank you! Positive feedback from prawnographer on Fri, 24 Jul 2015 02:05:42 -0500: I bought from latias_latios_7. Purchased a perler bead sprite game. the description was accurate and the sprite well made. Thank you! Positive feedback from pachirichu on Thu, 23 Jul 2015 23:34:38 -0500: I bought from latias_latios_7. Positive feedback from classypersian on Thu, 23 Jul 2015 18:38:41 -0500: I bought from latias_latios_7. She made me a cute jigglypuff sprite for the personality game thanks! Positive feedback from thedaftlynx on Thu, 23 Jul 2015 08:43:27 -0500 for this transaction: I bought from latias_latios_7. I bought a bead sprite from latias_latios_7's game, and not only her choice was spot-on but the sprite looks fantastic and arrived quickly and well protected. Very friendly seller and great communication. Thank you so much!! Positive feedback from akisazame77 on Tue, 21 Jul 2015 00:32:55 -0500 for this transaction: I bought from latias_latios_7. Excellent job with the Massive Trading GA, great handling of shipping, and excellent job making sure everyone received their items. Positive feedback from gustygarchomp on Fri, 17 Jul 2015 16:03:37 -0500: I bought from latias_latios_7. bought one of there mystery sprites, so cute! thank you! Positive feedback from spritzzie on Thu, 16 Jul 2015 09:40:37 -0500: I traded with latias_latios_7. We traded some TCG cards! Good communication and the cards arrived safely! Positive feedback from blupanther on Thu, 16 Jul 2015 07:59:32 -0500: I participated in a GA with latias_latios_7. My feraligatr TFG arrived safely from the GA. Thanks so much! Positive feedback from zamakiko on Wed, 15 Jul 2015 17:21:30 -0500: I bought from latias_latios_7. I bought a perler bead kricketot. Super adorable! Fast shipping, great communication. Positive feedback from lilac_latte on Wed, 15 Jul 2015 01:42:23 -0500: I bought from latias_latios_7. Positive feedback from xzeeko on Wed, 15 Jul 2015 00:06:15 -0500: I traded with latias_latios_7. I traded a Sceptile Amigurumi for Dot Sprites of the Goomy Line, and they came well packaged, well made, and completely adorable! Thanks much! Positive feedback from fluffyfurret on Tue, 14 Jul 2015 23:47:18 -0500: I participated in a GA with latias_latios_7. Positive feedback from lordboop on Tue, 14 Jul 2015 15:28:41 -0500: I traded with latias_latios_7. Traded some cards! Arrived quickly and with no damage! Positive feedback from hantsukihaunter on Tue, 14 Jul 2015 13:36:22 -0500: I sold to latias_latios_7. Sold a Deoxys Chess Piece, Celebi Kid, Celebi Pencil Topper, Aron Pokedex figure, Tomy Beautifly Mini figure, and Duskull Chocoball figure. Great communication, paid on time, and easy to work with. Thanks! Positive feedback from synysterxskittl on Sun, 12 Jul 2015 23:12:21 -0500: I traded with latias_latios_7. Traded a bunch of kid figures for a handful of sprites. Thank you very much! Communication was great, and everything was shipped very quickly. Positive feedback from glitterzookas on Sun, 12 Jul 2015 10:37:13 -0500: I participated in a GA with latias_latios_7. Positive feedback from glitterzookas on Sun, 12 Jul 2015 10:12:57 -0500: I traded with latias_latios_7. Positive feedback from absol on Sat, 11 Jul 2015 16:35:46 -0500: I bought from latias_latios_7. Positive feedback from absol on Sat, 11 Jul 2015 16:35:12 -0500: I participated in a GA with latias_latios_7. I won a Zangoose TFG in the auction which was hosted from latias_latios_7. Speedy shipping and it was very well organized. Thank you! Positive feedback from watabi on Fri, 10 Jul 2015 23:00:40 -0500: I bought from latias_latios_7. Bought a sprite. Seller was very kind and polite. A pleasure to do business with. Thank you! Positive feedback from fox7xd on Fri, 10 Jul 2015 22:14:33 -0500: I participated in a GA with latias_latios_7. Won an eevee tcg figure in the auction. They were super nice and the auction was handled smoothly ^u^/ I look forward to any future GA they run. Item arrived safe and sound! Positive feedback from mercurrix on Fri, 10 Jul 2015 21:03:09 -0500: I bought from latias_latios_7. Bought a mystery personality perler sprite. As always, great communication and transaction :) Thank you! Positive feedback from chiidoru on Thu, 9 Jul 2015 18:38:35 -0500: I sold to latias_latios_7. I sold them a Suicune Pokedoll. They paid within the promised time frame and it was a smooth transaction! Thanks a bunch! Positive feedback from aceattorneygirl on Thu, 9 Jul 2015 17:43:32 -0500: I traded with latias_latios_7. Did a trade with this user. Positive feedback from mercurrix on Wed, 8 Jul 2015 21:54:47 -0500: I participated in a GA with latias_latios_7. Participated in a GA co-run byt Latias_Latios_7. Item arrived safely and the GA ran smoothly. Thank you! Positive feedback from m14mouse on Tue, 7 Jul 2015 15:20:56 -0500: I bought from latias_latios_7. I brought Mr. Weedle and Torchic from Trading figure GA. Everything went awesome and my items came safely! Thank you! Positive feedback from sharp_claw on Mon, 6 Jul 2015 13:25:48 -0500: I bought from latias_latios_7. Positive feedback from spritzzie on Mon, 6 Jul 2015 12:17:26 -0500: I traded with latias_latios_7. I traded a TCG card for a TCG card! They told me when they shipped it out and it arrived safely! Positive feedback from kinbell on Mon, 6 Jul 2015 06:10:15 -0500: I bought from latias_latios_7. Participated in their personality game and I got a Xatu sprite and I'm still amazed at how accurate the description of me is based on the Pokemon I've got. Thank you! Positive feedback from hamsterbomb27 on Sun, 5 Jul 2015 23:17:00 -0500 for this transaction: I bought from latias_latios_7. Thanks for hosting this! I got two TFG figures and they arrived quickly and safely. Also handled a mistake quickly and helpfully (That was actually not even her fault!). Thank you! Positive feedback from ice_kestrel9 on Sun, 5 Jul 2015 15:39:17 -0500: I participated in a GA with latias_latios_7. I participated in the Massive Trading GA. My two TFG figures arrived quickly, and in great condition! The GA went very smoothly overall. Thanks for hosting this group auction~! Positive feedback from blueringumbreon on Sat, 4 Jul 2015 23:26:23 -0500 for this transaction: I bought from latias_latios_7. I got a perler sprite from latias_latios_7s personality game. I really enjoyed participating, and the sprite I received is so cute! Thank you! Positive feedback from dragntamerelise on Fri, 3 Jul 2015 16:15:23 -0500: I participated in a GA with latias_latios_7. Positive feedback from dsl_weegee on Fri, 3 Jul 2015 13:42:01 -0500: I bought from latias_latios_7. Bought a survey mystery sprite charm from her. I bought mine on her etsy, but was also available for sale on the community. Tbh, I was not expecting to get the Pokémon I got, but it was finished quickly and looks great! Overall, I am happy with this purchase and would be happy to do business with her in the future! Positive feedback from froakie on Mon, 29 Jun 2015 00:34:45 -0500 for this transaction: I sold to latias_latios_7. I sold: Latios charm - Thanks for your purchase! Positive feedback from luckymissclover on Sat, 27 Jun 2015 18:35:11 -0500: I bought from latias_latios_7. Purchased a "Perler Sprite Game". The seller sent me a mystery customized Pokemon perler sprite based on a survey I took. The sprite also came with a hand written note that explained the personality of the Pokemon which related to my survey answers. I ended up getting Flaffy! It's very well made and it ended up being bigger than I thought it would be! It was a very cute and fun game and totally worth it. Positive feedback from jadekitty777 on Tue, 23 Jun 2015 19:54:21 -0500: I bought from latias_latios_7. Bought the personality test bead sprite. Was finished and got here super quick! The card was a lovely touch. This was super fun! Positive feedback from lovestyle on Mon, 22 Jun 2015 17:43:57 -0500 for this transaction: I bought from latias_latios_7. I was happy to be able to buy a personality test perler sprite! <3 I absolutely loved my result, and the card written out with the reasoning was very thoughtful! Will definitely be prominently displaying it in my collection. c: Well-packaged, received in a timely manner. A+! Positive feedback from mixie94 on Sun, 21 Jun 2015 18:56:36 -0500: I bought from latias_latios_7. Positive feedback from bulbybulbasaur on Sun, 21 Jun 2015 14:56:32 -0500: I bought from latias_latios_7. Positive feedback from skdarkdragon on Sun, 21 Jun 2015 10:30:19 -0500: I sold to latias_latios_7. Paid for claimed items as soon as I commented again with the total! :) Great buyer~! Positive feedback from miss_minccino on Fri, 19 Jun 2015 14:12:22 -0500: I traded with latias_latios_7. Positive feedback from aarux on Tue, 16 Jun 2015 19:03:00 -0500: I sold to latias_latios_7. Positive feedback from m14mouse on Sun, 14 Jun 2015 20:21:56 -0500: I traded with latias_latios_7. We traded cards again. YAY! Will trade with anytime! Positive feedback from melodicrevival on Mon, 8 Jun 2015 17:36:18 -0500 for this transaction: I sold to latias_latios_7. Sold a custom bookmark to them. They paid promptly and were very nice to work with! Positive feedback from blupanther on Sat, 6 Jun 2015 12:08:51 -0500: I sold to latias_latios_7. User commissioned amigurumi! Fast payment and very friendly. Can't wait to get started on your plush! Positive feedback from bulbybulbasaur on Sat, 6 Jun 2015 09:39:52 -0500: I traded with latias_latios_7. Traded a couple Pokedolls for a perler sprite. Great communication, fast safe shipping. Positive feedback from hantsukihaunter on Fri, 5 Jun 2015 12:44:37 -0500: I bought from latias_latios_7. I commissioned them for a Morty & Haunter Perler Sprites. They turned out even better (and bigger!) than expected. Good communication and friendly buyer. The only thing that I found disappointing was that the sprites were bent during shipping but I imagine it would be hard to find a large enough package for these sprites. Positive feedback from magmanerd on Fri, 5 Jun 2015 10:14:02 -0500: I traded with latias_latios_7. Positive feedback from lulupin on Fri, 5 Jun 2015 03:30:27 -0500: I bought from latias_latios_7. Positive feedback from pkmnsuicune on Tue, 2 Jun 2015 18:45:39 -0500: I traded with latias_latios_7. Did a 2 for 2 trade with TCG cards. Shipping was reasonable and the cards came protected and in perfect condition! Positive feedback from leafyoddish98 on Sun, 31 May 2015 17:21:20 -0500: I traded with latias_latios_7. Positive feedback from yaoi_queen on Sun, 31 May 2015 01:24:13 -0500: I sold to latias_latios_7. They bough a custom Houndoom plush and a couple of kids. A pleasure doing business them. Positive feedback from shadoweon on Sat, 30 May 2015 16:26:59 -0500: I traded with latias_latios_7. Good communication and the cards arrived quickly. Would be happy to trade again,thank you! Positive feedback from classypersian on Sat, 30 May 2015 13:15:41 -0500: I traded with latias_latios_7. Positive feedback from chariflame on Sat, 30 May 2015 13:15:41 -0500 for this transaction: I bought from latias_latios_7. Bought a Team Magma pin and coin from this user. Good communication, fast shipping, a pleasure to do business with! Positive feedback from tdotakichan on Thu, 28 May 2015 16:47:57 -0500: I sold to latias_latios_7. Positive feedback from raymence on Wed, 27 May 2015 13:27:32 -0500: I traded with latias_latios_7. I traded a bunch of TCG cards with latias_latios__7. Communication was great and they shipped the letter out quickly. When the cards arrived, their condition was like described and everything was included. I'd definitely trade with them again! Positive feedback from tekiraboshi on Wed, 27 May 2015 13:04:08 -0500: I bought from latias_latios_7. Positive feedback from stalkingsuicune on Tue, 26 May 2015 19:52:50 -0500: I bought from latias_latios_7. Positive feedback from mizunosakura on Mon, 25 May 2015 19:24:01 -0500 for this transaction: I bought from latias_latios_7. Bought a big Mega Audino perler bead sprite :) Was kept up to date and it arrived wonderfully packaged! Looks amazing. Positive feedback from winterjellybean on Sat, 23 May 2015 12:50:40 -0500 for this transaction: I sold to latias_latios_7. Fast payment, great communication and would be happy to work with again. Positive feedback from m14mouse on Fri, 22 May 2015 07:00:02 -0500: I traded with latias_latios_7. We traded some cards. The cards came quickly and safely. Definitely trade with again. Positive feedback from shadowpokgengar on Mon, 18 May 2015 19:15:40 -0500: I traded with latias_latios_7. We traded A LOT of TCG cards! I got a ton of cards I was looking for and they were all in great condition. Communication was great, shipping was fast. Would love to trade again! Positive feedback from silverinfinity on Mon, 18 May 2015 14:02:51 -0500: I bought from latias_latios_7. I commissioned two perler sprites; Sharpedo and Mega Sharpedo. Communication was good throughout, and the end result looks awesome! I love them both! Positive feedback from m14mouse on Sat, 16 May 2015 20:47:12 -0500: I traded with latias_latios_7. We traded some cards. The cards came quickly and safely. Definately trade with again. Positive feedback from yaoi_queen on Fri, 15 May 2015 01:24:05 -0500: I sold to latias_latios_7. I sold a custom Houndoom plush to them. They were very cooperative, courteous, and paid quickly. I'd be happy to do business with them again. Positive feedback from risha_moon on Thu, 14 May 2015 23:14:19 -0500: I traded with latias_latios_7. Positive feedback from absol on Tue, 12 May 2015 11:29:30 -0500: I traded with latias_latios_7. Positive feedback from ssjvap on Mon, 11 May 2015 21:14:00 -0500 for this transaction: I bought from latias_latios_7. Bought a Zapdos keychain from their auctions. Fast replies and shipping. Thank you! Positive feedback from acidmimi on Mon, 11 May 2015 04:25:59 -0500: I traded with latias_latios_7. Positive feedback from fox7xd on Fri, 8 May 2015 17:12:47 -0500: I sold to latias_latios_7. Positive feedback from elcardenal12 on Thu, 7 May 2015 17:20:34 -0500: I traded with latias_latios_7. Traded some cards. Everything arrived safely. Thanks much! Positive feedback from j_ule on Thu, 7 May 2015 16:07:55 -0500: I traded with latias_latios_7. Once again, I did an art trade with Rachel and also a card trade, plus she middlemanned stuff for me. Awesome! :) Her sprites are excellent and everything went smoothly and the package came really fast. Positive feedback from synysterxskittl on Thu, 7 May 2015 15:02:24 -0500: I bought from latias_latios_7. Positive feedback from aceattorneygirl on Thu, 7 May 2015 10:54:56 -0500: I bought from latias_latios_7. I bought a custom V-Day Perler Bead sprite from them. It just looks super amazing and it arrived in one piece. Positive feedback from dubslider on Wed, 6 May 2015 15:34:36 -0500 for this transaction: I bought from latias_latios_7. I recently ordered an oversized Gallade EX card from them, and it arrived a couple of days ago. Very happy, though I was a bit worried about the mailer bending the card. Luckily, there was no damage. Phew! Thanks! Positive feedback from ninetails on Tue, 5 May 2015 12:08:44 -0500: I bought from latias_latios_7. Positive feedback from pupstergirl on Sun, 3 May 2015 14:58:24 -0500: I traded with latias_latios_7. We did an art trade of four drawings for two perler bead sprites! Latias_latios_7 completed her side of the trade incredibly quickly with great communication, super fast shipping and just an overall lovely user! Thank you so much for trading with me again! <3 It's been a pleasure! Positive feedback from knienke on Sun, 3 May 2015 14:54:46 -0500: I bought from latias_latios_7. She offered to be a middleman for me so I could buy something from Ebay. Thank you very much for your help! Very nice and kind member. Positive feedback from pepperzark on Thu, 30 Apr 2015 20:09:40 -0500: I traded with latias_latios_7. Just received their part of an art trade :) They were swift, communicated well, and they have been very patient. Thank you so much! Positive feedback from neeko48 on Tue, 28 Apr 2015 20:51:57 -0500: I sold to latias_latios_7. Positive feedback from diamondphantom on Mon, 27 Apr 2015 18:44:00 -0500: I traded with latias_latios_7. Positive feedback from diamondphantom on Mon, 27 Apr 2015 18:42:48 -0500: I bought from latias_latios_7. Positive feedback from elcardenal12 on Mon, 27 Apr 2015 16:48:28 -0500: I bought from latias_latios_7. Positive feedback from partywooper on Sat, 25 Apr 2015 15:14:05 -0500: I traded with latias_latios_7. We traded plush and perlers. Positive feedback from captainangel on Thu, 23 Apr 2015 14:47:35 -0500: I traded with latias_latios_7. Always welcome for trading again! <3 Thank you!! Positive feedback from hawlucha on Thu, 23 Apr 2015 11:46:06 -0500: I sold to latias_latios_7. User commissioned me for custom Pokedoll tags. As always, quick payment and good communication, thanks! Positive feedback from gabtizzle on Wed, 22 Apr 2015 21:26:17 -0500: I bought from latias_latios_7. comment: great communication and good service. definitely will do business with again. the perler sprite was also done very well with very accurate colors. Positive feedback from cardwhale on Wed, 22 Apr 2015 19:12:14 -0500: I sold to latias_latios_7. Sold Rattata plush and cubone strap. Paid right away! Positive feedback from zigguppafu on Sun, 19 Apr 2015 18:12:10 -0500: I sold to latias_latios_7. Positive feedback from hantsukihaunter on Sun, 19 Apr 2015 17:08:56 -0500: I sold to latias_latios_7. Positive feedback from ceruleanblues15 on Sat, 18 Apr 2015 17:52:02 -0500: I bought from latias_latios_7. Commissioned a giant sprite of Cheren and Stoutland and its simply beautiful. I'd recommend/purchase form them again! Positive feedback from solishark on Sat, 18 Apr 2015 17:27:32 -0500: I sold to latias_latios_7. Positive feedback from miss_minccino on Sat, 18 Apr 2015 11:43:02 -0500: I bought from latias_latios_7. Bought a card from this user, very friendly seller, the card was shipped really fast and arrived quickly. All around great seller! Thanks so much! Positive feedback from peppermmints on Fri, 17 Apr 2015 16:19:27 -0500: I traded with latias_latios_7. Positive feedback from pepperzark on Thu, 16 Apr 2015 21:13:50 -0500: I bought from latias_latios_7. Purchased some custom sprites. It took some time, but communication was well and I received them not long after they were shipped! They were also bigger than I expected which is always a plus! Positive feedback from shinamishi on Thu, 16 Apr 2015 16:36:57 -0500: I traded with latias_latios_7. We're in the process of trading cards and hers arrived! Communication was very quick and always friendly with her with both of us making constant amendments to our card list as we bought new ones and went through the lists over and over again, haha. Shipping was packaged very safely and arrived super quick! Was a delight trading with such a lovely person, and mine are on their way now! Positive feedback from charizard on Wed, 15 Apr 2015 04:21:24 -0500: I bought from latias_latios_7. Positive feedback from j_degnan on Mon, 13 Apr 2015 08:04:43 -0500: I bought from latias_latios_7. I purchased a copy of Alpha Sapphire from latias_latios_7, dispatched quickly, arrived in perfect condition. Excellent seller. Positive feedback from pegasus2010 on Fri, 10 Apr 2015 11:26:19 -0500: I sold to latias_latios_7. Sold a pokemon card deck box and a bulk of cards to this community member. Friendly to deal with and prompt payment. Excellent buyer! Positive feedback from lillyann123 on Wed, 8 Apr 2015 21:06:04 -0500 for this transaction: I sold to latias_latios_7. Amazing seller and prompt. Definitely a pleasure to sell! Positive feedback from rika_wulf on Wed, 8 Apr 2015 05:03:06 -0500: I bought from latias_latios_7. Positive feedback from shadowpokgengar on Tue, 7 Apr 2015 20:13:13 -0500: I traded with latias_latios_7. We traded some TCG cards. The trade was fair, communication was great, and shipping was fast! Positive feedback from dezchu on Tue, 7 Apr 2015 01:29:36 -0500: I sold to latias_latios_7. Sold Bulbasaur figure in December,They paid quickly and are welcome back anytime :). Positive feedback from zugagirl on Sun, 5 Apr 2015 12:07:28 -0500: I bought from latias_latios_7. Friendly seller and shipping was fast! Would buy from again! Positive feedback from pokezombie on Fri, 3 Apr 2015 15:15:51 -0500: I bought from latias_latios_7. They were completed alot sooner then i expected~ thanks! Positive feedback from bulbybulbasaur on Fri, 3 Apr 2015 14:27:35 -0500: I bought from latias_latios_7. Positive feedback from methuselah31010 on Fri, 3 Apr 2015 13:43:38 -0500: I bought from latias_latios_7. Great communication and shipped them quickly. They look great! Positive feedback from stalkingsuicune on Fri, 3 Apr 2015 12:40:46 -0500: I bought from latias_latios_7. Positive feedback from pegasus2010 on Thu, 2 Apr 2015 17:37:50 -0500 for this transaction: I sold to latias_latios_7. Sold a deck box including a bulk of cards to this member. Payment fast like lightning and super friendly to deal with. Excellent buyer! Positive feedback from raichu_love on Wed, 1 Apr 2015 14:41:21 -0500: I sold to latias_latios_7. Positive feedback from white_chocobo on Sun, 29 Mar 2015 21:05:24 -0500: I sold to latias_latios_7. Positive feedback from rika_wulf on Sat, 28 Mar 2015 03:43:15 -0500: I bought from latias_latios_7. Positive feedback from solishark on Tue, 24 Mar 2015 01:17:28 -0500: I traded with latias_latios_7. I traded a custom sculpture for one of their large perler sprites. They did awesome work, very happy with the trade. Good communication throughout too. Great experience! Positive feedback from spritzzie on Thu, 19 Mar 2015 08:40:38 -0500: I bought from latias_latios_7. I bought 2 Spritzee perler sprites! They communicated with me a lot and they shipped them out quickly. Would definitely buy from again! Positive feedback from midnitesilven on Thu, 19 Mar 2015 08:39:48 -0500: I bought from latias_latios_7. I bought a Mega Gengar pin and got it within a few days. Couldn't have asked for more! Positive feedback from vulpes_canis on Wed, 18 Mar 2015 18:44:49 -0500: I sold to latias_latios_7. Positive feedback from akeyma on Tue, 17 Mar 2015 15:56:55 -0500: I sold to latias_latios_7. sold a 2015 pkmnc paththag, received payment very promptly! good transaction. Thank you! Positive feedback from partywooper on Sun, 15 Mar 2015 17:21:14 -0500: I traded with latias_latios_7. Positive feedback from white_chocobo on Fri, 13 Mar 2015 22:40:28 -0500: I sold to latias_latios_7. i sold some zukans, great communication, and fast payment, thanks. Positive feedback from synysterxskittl on Wed, 11 Mar 2015 12:15:40 -0500: I bought from latias_latios_7. Positive feedback from absol on Wed, 11 Mar 2015 09:43:49 -0500: I bought from latias_latios_7. I bought a Mega Absol and Absol perler sprite. She did a very great job! :D I love the both <3 And shipping was very fast :) I think i will come back to you haha. Positive feedback from mercurrix on Mon, 9 Mar 2015 17:06:17 -0500: I traded with latias_latios_7. We traded and Latias_latios_7 made me an amazing weavile perler sprite. It arrived safely and I love it! Smooth trade with no problems at all. Thank you! Positive feedback from creampuffoholic on Mon, 9 Mar 2015 16:23:08 -0500: I bought from latias_latios_7. Positive feedback from chocolate_chip on Sun, 8 Mar 2015 06:38:29 -0500: I sold to latias_latios_7. Positive feedback from syminka on Sat, 7 Mar 2015 00:28:09 -0600: I sold to latias_latios_7. Positive feedback from tdotakichan on Fri, 6 Mar 2015 18:35:23 -0600: I bought from latias_latios_7. I bought a custom amigurumi from them at a great price and was very well made. It was made and arrived quickly and I love it lots thanks! Positive feedback from meeka_meerkat on Thu, 5 Mar 2015 20:12:50 -0600 for this transaction: I sold to latias_latios_7. Always friendly :D This is someone I trust 100%! Thanks again for another smooth purchase! Positive feedback from violet_rare on Fri, 27 Feb 2015 20:32:37 -0600: I bought from latias_latios_7. Positive feedback from roussil on Thu, 26 Feb 2015 11:55:27 -0600: I bought from latias_latios_7. latias_latios_7 helped me to get two items I was after by middlemaning them to me ! The communication was absolutely great, she was really helpful and sent my parcel to me very quickly ! Everything arrived really fast and in excellent condition. Thank you so much ! Positive feedback from kingfeebas on Tue, 24 Feb 2015 22:16:35 -0600: I sold to latias_latios_7. A custom Sculptre, paid on time! Positive feedback from chocolate_chip on Tue, 24 Feb 2015 18:16:10 -0600: I sold to latias_latios_7. Participated in my Mega Pikazard gacha group. Paid very quickly, and was a smooth and pleasant transaction. Thanks! Positive feedback from fox7xd on Fri, 20 Feb 2015 19:38:16 -0600: I sold to latias_latios_7. Positive feedback from ninfiachan on Thu, 19 Feb 2015 19:46:31 -0600: I bought from latias_latios_7. Positive feedback from poliwhirl on Mon, 16 Feb 2015 11:40:25 -0600: I sold to latias_latios_7. Sold a pikazard figure, paid quickly, thanks! Positive feedback from psychopathwolfy on Fri, 13 Feb 2015 16:35:53 -0600: I bought from latias_latios_7. Positive feedback from doryphish333 on Fri, 13 Feb 2015 08:24:01 -0600: I bought from latias_latios_7. Shiny Entei Perler Sprite. They were willing to work with me and this attempt 2 of 2 and it turned out lovely! Thank you so much! Positive feedback from kitzune on Fri, 13 Feb 2015 08:16:35 -0600 for this transaction: I sold to latias_latios_7. Bought several Goomy gacha figures from my sales. Smooth transaction, paid quickly, welcome back any time! Positive feedback from shadoweon on Sat, 31 Jan 2015 17:23:28 -0600: I traded with latias_latios_7. Did a little holiday trade over Christmas where we traded pokemon cards and holiday cards. Positive feedback from pocketmonstrmeg on Thu, 29 Jan 2015 14:22:05 -0600: I sold to latias_latios_7. I sold an emolga plush! Awesome buyer thank you so much! :D Enjoy emolga! Positive feedback from synysterxskittl on Mon, 26 Jan 2015 16:24:51 -0600: I bought from latias_latios_7. Positive feedback from fluffyfurret on Sat, 24 Jan 2015 23:56:11 -0600: I bought from latias_latios_7. Positive feedback from sigiblue on Sat, 24 Jan 2015 18:50:01 -0600: I bought from latias_latios_7. Positive feedback from partywooper on Thu, 22 Jan 2015 01:58:41 -0600: I traded with latias_latios_7. I can't thank her enough for all of the generous gifts! They were packaged up nicely, and were the perfect little winter surprise. Positive feedback from moonliteumbreon on Wed, 21 Jan 2015 07:04:26 -0600: I bought from latias_latios_7. Positive feedback from heroponriki on Tue, 20 Jan 2015 20:36:45 -0600: I sold to latias_latios_7. Positive feedback from natsu_neko on Fri, 16 Jan 2015 14:34:58 -0600: I traded with latias_latios_7. Traded a piece of custom digital art for two perler bead sprites of Leafeon and Glaceon. Lovely work and aswesome to trade with! Positive feedback from pachirichu on Fri, 16 Jan 2015 10:50:07 -0600: I bought from latias_latios_7. Bought two Furret perler bead sprites. Positive feedback from cardwhale on Wed, 14 Jan 2015 20:00:42 -0600: I sold to latias_latios_7. Charizard X figure. No problems with the transaction! :) Thank you! Positive feedback from skdarkdragon on Tue, 13 Jan 2015 07:37:05 -0600: I sold to latias_latios_7. Positive feedback from eledora on Sun, 11 Jan 2015 12:35:48 -0600 for this transaction: I sold to latias_latios_7. Positive feedback from victorsaurus5 on Fri, 9 Jan 2015 13:50:30 -0600 for this transaction: I traded with latias_latios_7. Traded some English TCG cards. Great communication and fast shipping. Thanks. Positive feedback from cosmicxlove on Mon, 5 Jan 2015 20:53:16 -0600: I traded with latias_latios_7. did a swap for holiday gifts! her portion was absolutely amazing and arrived safely. more than happy to do so again! Positive feedback from stalkingsuicune on Mon, 5 Jan 2015 18:03:06 -0600: I sold to latias_latios_7. Positive feedback from vulpeslagopus on Sun, 28 Dec 2014 22:51:28 -0600: I sold to latias_latios_7. Positive feedback from mitchichen on Tue, 23 Dec 2014 20:55:21 -0600: I bought from latias_latios_7. Positive feedback from partywooper on Thu, 18 Dec 2014 18:34:30 -0600: I bought from latias_latios_7. Seller made an awesome (and not to mention huge!) perler sprite for an excellent price! Positive feedback from squareofme on Mon, 15 Dec 2014 05:17:50 -0600: I bought from latias_latios_7. Most importantly the sprites look fantastic, thank you so much! Definitely recommended. Positive feedback from violetcyrene on Wed, 10 Dec 2014 04:11:36 -0600: I bought from latias_latios_7. Positive feedback from pupstergirl on Tue, 2 Dec 2014 14:44:47 -0600: I traded with latias_latios_7. We did an art trade together! AMAZING customer service, absolutely brilliant! They replaced their side of the trade after the first package got lost in the mail. Thank you SO much for trading with me! I adore the sprites and I would love to trade with you again :D I highly recommend doing business with this user!!! Positive feedback from mizunosakura on Fri, 28 Nov 2014 19:54:13 -0600 for this transaction: I bought from latias_latios_7. Positive feedback from pocketmonstrmeg on Fri, 28 Nov 2014 12:14:36 -0600: I sold to latias_latios_7. I sold a DX Fuzzy Pikachu! Very quick payment and very kind person! Thank you so much! :D You're welcome to my sales any time! Positive feedback from toukos on Fri, 14 Nov 2014 18:58:23 -0600 for this transaction: I sold to latias_latios_7. Positive feedback from luckymissclover on Thu, 6 Nov 2014 13:01:43 -0600: I sold to latias_latios_7. Positive feedback from poliwhirl on Wed, 5 Nov 2014 19:40:43 -0600: I sold to latias_latios_7. Took part in my Fairy Ippai Collection Pick up. Paid fast (early) and easy to work with. Thanks! Positive feedback from opossumpanda on Mon, 3 Nov 2014 19:03:20 -0600: I traded with latias_latios_7. Positive feedback from ceruleanblues15 on Mon, 3 Nov 2014 17:56:46 -0600: I bought from latias_latios_7. I purchased a Pokeball capsule for the gold cards from this user and the item got here safe and sound ^_^ Thanks again! Positive feedback from hawlucha on Mon, 3 Nov 2014 16:49:34 -0600: I sold to latias_latios_7. Positive feedback from stalkingsuicune on Mon, 3 Nov 2014 14:14:47 -0600: I bought from latias_latios_7. Positive feedback from soiledpoetry on Sat, 1 Nov 2014 22:49:52 -0500: I bought from latias_latios_7. Positive feedback from yellowmudkip on Sat, 1 Nov 2014 22:43:38 -0500 for this transaction: I participated in a GA with latias_latios_7. Positive feedback from scarity on Mon, 27 Oct 2014 09:26:14 -0500: I participated in a GA with latias_latios_7. I participated in a GA hosted by latias_latios_7 and Partywhooper. It all was a great experience they were very nice and I got my skitties in perfect condition really fast, super happy! Thank you! Positive feedback from kingfeebas on Sat, 25 Oct 2014 12:38:28 -0500: I sold to latias_latios_7. Commissioned a Male Frillish Sculpture- Paid and responded quickly! Positive feedback from partywooper on Wed, 22 Oct 2014 21:02:16 -0500: I participated in a GA with latias_latios_7. This user was an awesome co-host for our GA. It wouldn't have been possible without her. Prompt payment for her claimed item. Positive feedback from neosquid on Tue, 21 Oct 2014 21:04:56 -0500: I bought from latias_latios_7. I bought custom Sableye, Ludicolo, and Ledian sprites, turned out well. Positive feedback from selwylde on Mon, 20 Oct 2014 05:31:52 -0500: I bought from latias_latios_7. Positive feedback from captainangel on Sat, 18 Oct 2014 10:51:57 -0500: I sold to latias_latios_7. Positive feedback from razeasha on Thu, 16 Oct 2014 21:39:44 -0500: I sold to latias_latios_7. Positive feedback from thedaftlynx on Thu, 16 Oct 2014 09:36:08 -0500 for this transaction: I bought from latias_latios_7. Positive feedback from ivyaggron on Wed, 15 Oct 2014 18:10:27 -0500: I sold to latias_latios_7. Sold a MIP Hasbro Spinarak figure, was quick to pay and communicate~ Thanks a bunch! Positive feedback from spliced100 on Wed, 15 Oct 2014 16:09:39 -0500: I sold to latias_latios_7. I sold a Furret custom trinket. Great communication, always welcome to my sales. Thank you again! Positive feedback from jen81489 on Wed, 15 Oct 2014 02:04:37 -0500 for this transaction: I bought from latias_latios_7. Positive feedback from jen81489 on Wed, 15 Oct 2014 02:01:55 -0500 for this transaction: I bought from latias_latios_7. I commissioned a whole bunch of pearler sprites from her. She kept communication open and provided updates with the progress. Once they were shipped, they arrived quickly! Positive feedback from allrealelements on Mon, 13 Oct 2014 13:25:46 -0500: I bought from latias_latios_7. Purchased a Jirachi print from this user. Item was shipped promptly and carefully packaged inside a poster tube, arrived in perfect condition. Positive feedback from winterjellybean on Fri, 10 Oct 2014 23:47:41 -0500 for this transaction: I sold to latias_latios_7. Positive feedback from hanteninuyasha on Fri, 10 Oct 2014 13:36:47 -0500: I bought from latias_latios_7. Positive feedback from agui_chan on Mon, 6 Oct 2014 15:22:14 -0500: I sold to latias_latios_7. Sold three custom bookmarks. The communication during the creation process was nice and a pleause to work with. Thanks. Positive feedback from poliwhirl on Mon, 6 Oct 2014 10:00:50 -0500: I sold to latias_latios_7. Positive feedback from dsl_weegee on Sun, 5 Oct 2014 19:42:03 -0500: I bought from latias_latios_7. I bought a couple of custom charms from you, and they're awesome! Positive feedback from shuuichi_chan on Wed, 1 Oct 2014 10:26:05 -0500: I sold to latias_latios_7. Sold a charm, quick payment and good communication as always. Thanks! Positive feedback from toxiee on Tue, 30 Sep 2014 01:28:40 -0500: I sold to latias_latios_7. They commissioned me for 4 prints. Payment was prompt and communication was friendly and quick. Positive feedback from skittyfan on Sat, 27 Sep 2014 22:25:40 -0500: I sold to latias_latios_7. A wonderful buyer; they were excellent at communication and paid right on time! Thank you! Positive feedback from shuuichi_chan on Wed, 24 Sep 2014 10:45:06 -0500: I sold to latias_latios_7. Positive feedback from nightmare_chan2 on Mon, 22 Sep 2014 22:33:00 -0500: I sold to latias_latios_7. Positive feedback from meeka_meerkat on Mon, 22 Sep 2014 00:05:11 -0500 for this transaction: I bought from latias_latios_7. Commissioned these 6 beautiful Bead Sprites! My first time owning bead sprites and they're awesome, and great quality! I keep Meowstic, Kangaskhan, and Klefki in the back of my car. Usually when it's sunny, they reflect onto the window and I can see them while driving. They're super fun. Thank you! Positive feedback from natsu_neko on Fri, 19 Sep 2014 12:08:16 -0500: I bought from latias_latios_7. Bought two Sylveon bead sprites. Quick and amazing work! Thank you! Positive feedback from mcmc11 on Tue, 9 Sep 2014 19:25:05 -0500: I bought from latias_latios_7. friendly seller with good communication, the perler sprite was well made, thank you!! Positive feedback from hawlucha on Sat, 6 Sep 2014 06:03:50 -0500: I sold to latias_latios_7. Positive feedback from miles_dixon on Thu, 28 Aug 2014 10:08:09 -0500: I bought from latias_latios_7. Positive feedback from noibatcutie on Thu, 21 Aug 2014 12:25:57 -0500: I bought from latias_latios_7. Bought a perler sprite for my sister's birthday and I know she's going to love it! it's super adorable and well made as always! Thanks so much! Positive feedback from raichu_love on Thu, 21 Aug 2014 05:58:03 -0500: I bought from latias_latios_7. Bought some custom made perler sprites from user. Sprites were very beautiful and well made, they make a great addition to my collection. Thank you! Positive feedback from kaffeina on Wed, 20 Aug 2014 22:22:35 -0500: I bought from latias_latios_7. Positive feedback from pikafreakrachel on Wed, 20 Aug 2014 21:59:43 -0500: I bought from latias_latios_7. Positive feedback from creampuffoholic on Wed, 20 Aug 2014 15:03:51 -0500: I bought from latias_latios_7. Positive feedback from peppermmints on Wed, 20 Aug 2014 14:01:54 -0500: I traded with latias_latios_7. traded a Celebi EX card for some custom peeler sprites. Positive feedback from mastershambler on Wed, 20 Aug 2014 13:45:45 -0500: I bought from latias_latios_7. Bought some Pokemon and non Pokemon perlers! Excellent communication and excellent artistic ability. Highly recommended! Positive feedback from samo22 on Sun, 17 Aug 2014 20:31:01 -0500: I bought from latias_latios_7. I bought a Chespin pin from her "shipping only" sales. It came quickly and well packaged! Positive feedback from 12mermaid on Wed, 13 Aug 2014 20:50:25 -0500: I bought from latias_latios_7. Pokebox vaporeon charm ! Everything went great! Positive feedback from j_ule on Fri, 8 Aug 2014 14:00:04 -0500: I traded with latias_latios_7. latias_latios_7 did an art trade with me. In exchange for some drawings, she made me some Pokemon perler sprites which are absolutely lovely and well done! Positive feedback from agui_chan on Fri, 8 Aug 2014 08:08:58 -0500: I traded with latias_latios_7. I trade two bookmarks for sprites. They are huge and really well made and it was super easy to talk with. Thank you very much! Positive feedback from tdotakichan on Thu, 7 Aug 2014 20:59:36 -0500: I bought from latias_latios_7. Positive feedback from gengareric on Thu, 7 Aug 2014 10:58:03 -0500: I participated in a GA with latias_latios_7. Positive feedback from tyrumpatumpatum on Wed, 6 Aug 2014 20:36:17 -0500: I bought from latias_latios_7. I bought a copy of Pokemon Colosseum for the Gamecube. I got it for a great deal in like new condition. Arrived quickly and seller was awesome! Thanks! Positive feedback from rahenna on Wed, 6 Aug 2014 16:43:22 -0500: I sold to latias_latios_7. Sold three small figures! Fast payment and great communication, thanks! Positive feedback from blackfruitbat on Tue, 5 Aug 2014 20:01:34 -0500 for this transaction: I sold to latias_latios_7. Fantastic buyer! Fast communication and payment! Very friendly, would happily do business with again! Positive feedback from neeko48 on Mon, 4 Aug 2014 21:45:48 -0500: I sold to latias_latios_7. Positive feedback from normandyai on Tue, 29 Jul 2014 00:30:24 -0500: I bought from latias_latios_7. I bought a pokemon Wallet from this user, and I am very impressed with it. Wallet is in quality as described by the seller. The shipping however was unlike any I've seen before. Ultra padded USPS package made it very very secure and safe to insure it wasn't damaged in shipment. Very please with the transaction. Positive feedback from joy_dust on Mon, 28 Jul 2014 22:52:34 -0500: I bought from latias_latios_7. I bought another perler sprite and it was completed and shipped out fast and arrived safe and sound! Thank you! Positive feedback from yellow_fr3ak on Fri, 25 Jul 2014 19:52:56 -0500 for this transaction: I sold to latias_latios_7. Positive feedback from pokemastersan on Thu, 24 Jul 2014 16:03:34 -0500: I bought from latias_latios_7. Bought some perler sprites, they are absolutely amazing! Fantastic seller. Positive feedback from kingfeebas on Wed, 23 Jul 2014 17:49:06 -0500: I sold to latias_latios_7. Very patient and paid on time! Positive feedback from viaticvenusaur on Tue, 22 Jul 2014 22:31:20 -0500: I sold to latias_latios_7. Latias_latios_7 is a very friendly buyer and prompt payer, which made the transaction to go smoothly! Thank you! Positive feedback from technicolorcage on Mon, 21 Jul 2014 18:45:27 -0500: I traded with latias_latios_7. Traded a Celebi handkerchief for a few perler bead sprites. Was friendly and wonderful to work with and I'd love to do business with again. Thank you! Positive feedback from cinivala on Mon, 21 Jul 2014 16:28:42 -0500: I sold to latias_latios_7. sold a clearfile, easy transaction, great communication, thanks! Positive feedback from cardwhale on Mon, 21 Jul 2014 02:36:15 -0500: I sold to latias_latios_7. Sold Chimecho. paid right away! Positive feedback from vulpes_canis on Sun, 20 Jul 2014 20:30:49 -0500: I sold to latias_latios_7. Positive feedback from kayeechu1993 on Sun, 20 Jul 2014 01:15:57 -0500 for this transaction: I bought from latias_latios_7. Positive feedback from silentsceptile on Sat, 19 Jul 2014 22:55:32 -0500: I bought from latias_latios_7. Perfect perler sprites! All 24 of them! Came very fast and well packaged! Positive feedback from joy_dust on Fri, 18 Jul 2014 23:14:30 -0500: I bought from latias_latios_7. I bought two different Togetic sprites and they arrived safe and sound. Well made and simply adorable! Thanks! Positive feedback from 12mermaid on Wed, 16 Jul 2014 22:56:30 -0500: I sold to latias_latios_7. A maril line of figures ! Very good with communication and paid in a awesome time!! Positive feedback from digivolution on Wed, 16 Jul 2014 15:35:45 -0500 for this transaction: I bought from latias_latios_7. Bought a travel kit for my 3ds, thank you so much!! Positive feedback from luciferbram on Wed, 16 Jul 2014 13:40:39 -0500: I bought from latias_latios_7. I bought large and small Shedinja sprites which honestly could have been packed better. They arrived bent and had to be left between heavy books overnight and they're still a little bent. But they look nice and the communication was good so I'll leave positive and not neutral feedback. Positive feedback from toukos on Tue, 15 Jul 2014 20:42:40 -0500: I bought from latias_latios_7. Bought a pokeball. Arrived quickly safe and sound. Would be happy to buy from again, thank you! Positive feedback from myntii on Tue, 15 Jul 2014 19:43:09 -0500: I sold to latias_latios_7. Sold user a gym badge from my storenvy store. Prompt payment, thank you! Positive feedback from fluffyfurret on Sat, 12 Jul 2014 17:57:13 -0500: I bought from latias_latios_7. Positive feedback from pikabulbachu on Sat, 12 Jul 2014 17:54:24 -0500: I bought from latias_latios_7. Positive feedback from leafyoddish98 on Fri, 11 Jul 2014 21:54:32 -0500: I sold to latias_latios_7. Positive feedback from ktmonkeyj on Fri, 11 Jul 2014 12:03:43 -0500: I sold to latias_latios_7. Positive feedback from anaildapinto on Wed, 9 Jul 2014 15:45:39 -0500: I sold to latias_latios_7. I sold her two custom keychains: a migthyena and an OC pony. Very quick to answer and friendly! Positive feedback from helloskitty on Tue, 8 Jul 2014 12:59:24 -0500: I sold to latias_latios_7. Positive feedback from creampuffoholic on Tue, 8 Jul 2014 10:11:22 -0500: I sold to latias_latios_7. Positive feedback from tdotakichan on Fri, 4 Jul 2014 17:16:26 -0500: I participated in a GA with latias_latios_7. Positive feedback from opossumpanda on Tue, 1 Jul 2014 21:07:28 -0500: I sold to latias_latios_7. Positive feedback from okgod on Sat, 28 Jun 2014 22:31:17 -0500 for this transaction: I bought from latias_latios_7. Bought custom perler beads! :D They came out so nice, and latias was clear with communication ^u^ Would definitely recommend them to anybody! Positive feedback from kitsunekei on Wed, 25 Jun 2014 05:54:05 -0500 for this transaction: I sold to latias_latios_7. Sold a latios/latias bath salt figure, they paid promptly and seemed like the perfect buyer! Positive feedback from agkelikos on Tue, 24 Jun 2014 05:11:03 -0500: I traded with latias_latios_7. Positive feedback from pachirisu on Mon, 16 Jun 2014 11:16:04 -0500: I sold to latias_latios_7. sold them small trozei stickers. they paid fast and were great to deal with, thanks! Positive feedback from cardwhale on Mon, 16 Jun 2014 00:43:41 -0500: I sold to latias_latios_7. Chimecho pokedoll. Paid right away. Thank you. Positive feedback from prnzs on Thu, 12 Jun 2014 14:57:52 -0500: I sold to latias_latios_7. I sold blind packaged pins to them, payment was quick and despite complications they were very understanding. Thank you so much and hope to see you again! Positive feedback from johnnytoon on Mon, 9 Jun 2014 16:57:14 -0500: I sold to latias_latios_7. very nice person! and prompt payment! Positive feedback from avew14 on Thu, 5 Jun 2014 15:01:06 -0500: I bought from latias_latios_7. 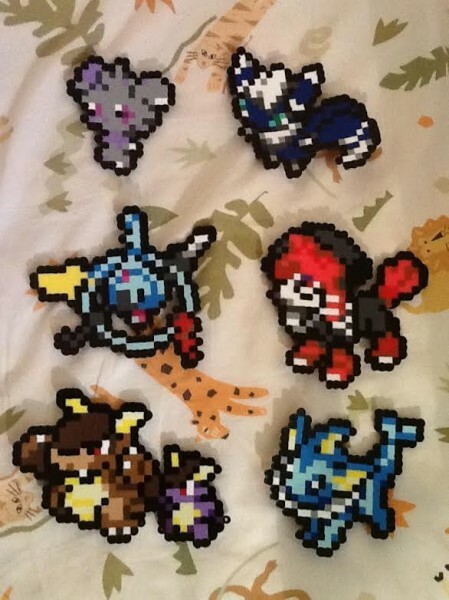 Bought 6 perler pokemons, which came out amazing! Thx for the sale :). Great transaction overall. Positive feedback from selwylde on Wed, 4 Jun 2014 11:48:04 -0500: I bought from latias_latios_7. Positive feedback from mitchichen on Tue, 3 Jun 2014 02:14:27 -0500: I bought from latias_latios_7. Positive feedback from b4ckbone on Mon, 2 Jun 2014 17:56:43 -0500: I bought from latias_latios_7. Positive feedback from serenitysamaa on Mon, 2 Jun 2014 16:50:02 -0500: I sold to latias_latios_7. I sold an Espeon pouch to them, payment was quick. Thanks so much! Positive feedback from chariflame on Mon, 2 Jun 2014 16:27:57 -0500 for this transaction: I sold to latias_latios_7. Prompt payment, lovely to do business with! Positive feedback from peppermmints on Mon, 2 Jun 2014 13:53:00 -0500: I bought from latias_latios_7. Bought 2 Perler sprites. Easy and pleasant transaction - perler sprites were done so quickly and look wonderful. Thanks! Positive feedback from prawnographer on Mon, 2 Jun 2014 04:15:25 -0500: I bought from latias_latios_7. Perler sprites. Shipped promptly, great quality customs, thanks! Positive feedback from fluffyfurret on Sat, 31 May 2014 17:15:44 -0500: I traded with latias_latios_7. Positive feedback from chronidu on Wed, 28 May 2014 17:33:08 -0500: I sold to latias_latios_7. Sold a set of stickers, received prompt payment and great communication, very pleased! Positive feedback from herar on Wed, 28 May 2014 00:24:33 -0500: I sold to latias_latios_7. Positive feedback from polahbear on Tue, 27 May 2014 20:51:22 -0500: I sold to latias_latios_7. sold espeon kyunchara and a female meowstic strap, thank you for the quick payment! Positive feedback from felixkeep on Tue, 27 May 2014 18:46:19 -0500: I sold to latias_latios_7. Positive feedback from herar on Sun, 25 May 2014 20:40:42 -0500: I sold to latias_latios_7. I sold a custom pouch - user paid quickly and very nice! thank you! Positive feedback from ktmonkeyj on Thu, 22 May 2014 12:31:25 -0500: I sold to latias_latios_7. I did a commission Celebi Wall clock for latias_latios_7, they also purchased a Team Rocket poster and bookmark from my shop. Great communication and prompt payment, would love to do business with again! Positive feedback from aburamechan on Sun, 18 May 2014 21:26:02 -0500: I sold to latias_latios_7. Sold a clearfile. :D easy transaction! Positive feedback from onathursday on Sat, 17 May 2014 23:50:48 -0500 for this transaction: I bought from latias_latios_7. Purchased some pearler sprites and they look amazing! Positive feedback from opossumpanda on Tue, 13 May 2014 12:58:29 -0500: I bought from latias_latios_7. Positive feedback from noibatcutie on Sat, 10 May 2014 20:02:33 -0500: I sold to latias_latios_7. Positive feedback from banaa1212 on Fri, 9 May 2014 16:40:56 -0500: I sold to latias_latios_7. Awesome buyer! Super polite and always had fast responses. Fast payment too! Positive feedback from pandaeatworld on Wed, 7 May 2014 02:10:24 -0500: I traded with latias_latios_7. Traded with this user, awesome communication,recommended! Positive feedback from kasumisukimix on Mon, 5 May 2014 21:48:03 -0500: I bought from latias_latios_7. Positive feedback from kingfeebas on Mon, 5 May 2014 18:35:59 -0500: I bought from latias_latios_7. Nicely made and for such an awesome price, will defiantly consider buying/trading in the future for some more! Positive feedback from hanteninuyasha on Fri, 2 May 2014 19:35:20 -0500: I bought from latias_latios_7. Positive feedback from creampuffoholic on Tue, 29 Apr 2014 00:24:44 -0500: I bought from latias_latios_7. I got 2 teams of perler sprites. Thank you so much! Positive feedback from sophiesplush on Mon, 21 Apr 2014 13:49:48 -0500: I bought from latias_latios_7. I bought a perler bead set. Very nice! Thanks! Positive feedback from xxstarcassxx on Sun, 20 Apr 2014 22:29:58 -0500: I traded with latias_latios_7. Positive feedback from vulpeslagopus on Fri, 18 Apr 2014 22:31:43 -0500: I bought from latias_latios_7. Positive feedback from ivyaggron on Fri, 18 Apr 2014 12:39:32 -0500: I bought from latias_latios_7. I commissioned them for 6 perler sprites. c: Super good communication and way friendly~ Thanks a bunches! Positive feedback from myntii on Thu, 17 Apr 2014 21:40:23 -0500: I traded with latias_latios_7. User commissioned me for some charms, we traded some, and I also purchased some sprites from her! Great communication and prompt payment. My sprites arrived quickly and are very cute. Thanks again! Positive feedback from prnzs on Wed, 16 Apr 2014 02:27:54 -0500 for this transaction: I bought from latias_latios_7. Despite the small mix up I would buy from them again without hard feelings or hesitation. Positive feedback from rykerr1 on Wed, 9 Apr 2014 21:41:44 -0500: I traded with latias_latios_7. They were my secret swap partner! They sent some really great gifts, everything arrived on time, and they were really friendly. Thanks so much! Positive feedback from firebomb on Sun, 6 Apr 2014 16:23:49 -0500: I sold to latias_latios_7. Positive feedback from namelessfate1 on Fri, 4 Apr 2014 17:31:31 -0500 for this transaction: I bought from latias_latios_7. Houndoom bookmark. It arrived quickly! Thank you! Positive feedback from noibatcutie on Mon, 31 Mar 2014 20:05:07 -0500: I traded with latias_latios_7. Positive feedback from sorjei on Sun, 30 Mar 2014 12:44:05 -0500: I sold to latias_latios_7. Transaction went smoothly and quickly. Positive feedback from noibatcutie on Wed, 26 Mar 2014 20:16:12 -0500: I sold to latias_latios_7. I sold some Topps cards to this user and received payment promptly and was very friendly! Welcome back anytime! Thank you! Positive feedback from nerd on Tue, 25 Mar 2014 10:51:33 -0500: I bought from latias_latios_7. Positive feedback from skydramon on Mon, 24 Mar 2014 17:12:43 -0500: I bought from latias_latios_7. Originally purchased a copy of Pokémon Rumble Blast from, but the package arrived empty. Instead of receiving a partial refund, the seller agreed to make perler sprites for me in order to make up the value of the lost game. They maintained good communication and shipped promptly. I'd buy from them again. Thanks a bunch! Positive feedback from sorjei on Sun, 23 Mar 2014 20:16:24 -0500: I sold to latias_latios_7. Thanks for the smooth transaction and quick payment! Positive feedback from fluffyfurret on Sun, 23 Mar 2014 17:13:00 -0500: I bought from latias_latios_7. Bought a Furret, Mudkip, Mew, and Flareon perler sprite. Positive feedback from thelastfruit on Mon, 17 Mar 2014 21:51:58 -0500: I bought from latias_latios_7. beautiful work! so happy with the sprites! thank you so much! Positive feedback from myntii on Sun, 16 Mar 2014 20:19:42 -0500: I sold to latias_latios_7. Sold some N charms. Thanks for the quick payment! Positive feedback from xeeveex on Sat, 15 Feb 2014 22:02:20 -0600: I bought from latias_latios_7. You could say I bought, but in all seriousness this community member was a HUGE help in assisting me with getting a HQ UFO laying I <3 Eevee plush. As I'm unable to buy off ebay, they were kind enough to purchase on my behalf, receive the plush and then ship to me once it had arrived. So, so grateful and helpful, would definitely buy from/work with again. Thank you x1000! Positive feedback from n on Thu, 13 Feb 2014 01:07:34 -0600 for this transaction: I bought from latias_latios_7. Bought PKMN Rumble Blast from them as soon as I got paid. Very sweet and patient with me~ Definitely would deal with them again! Positive feedback from poke_zula on Tue, 14 Jan 2014 16:38:53 -0600: I sold to latias_latios_7. Positive feedback from jen81489 on Tue, 14 Jan 2014 01:37:03 -0600 for this transaction: I participated in a GA with latias_latios_7. Positive feedback from kitzune on Mon, 6 Jan 2014 00:11:43 -0600 for this transaction: I sold to latias_latios_7. I sold them a Froakie sleeping figure. Payment was on time, no problem with communication, positive experience. Welcome back any time! Positive feedback from poke_zula on Fri, 22 Nov 2013 21:29:47 -0600: I sold to latias_latios_7. Great buyer who paid quickly and maintained great communication. Welcome back any time! Positive feedback from baconscreation on Thu, 7 Nov 2013 18:36:08 -0600: I sold to latias_latios_7. I sold them a 3ds xl xerneas cover. They paid fast and had great communication. Would recommend! Positive feedback from caterpie on Wed, 6 Nov 2013 19:12:39 -0600: I participated in a GA with latias_latios_7. Participated in a GB held by this user for a set of Eeveelutions Pokebox charms. Everything went smoothly and while I forgot to let them know right away (oops! ), my charms arrived safe and sound! <3 Will love to deal with again, thanks! Positive feedback from lone_enigma on Wed, 25 Sep 2013 12:29:53 -0500: I bought from latias_latios_7. I purchased a Flareon PokeBox Lollipop charm. Very cute and arrived safely! Thank you so much for this lil guy! Positive feedback from polahbear on Tue, 24 Sep 2013 17:39:32 -0500: I sold to latias_latios_7. bought a flareon kyun chara from me, prompt payment, thanks! Positive feedback from em_lemon on Sun, 22 Sep 2013 21:30:42 -0500: I sold to latias_latios_7. I sold a custom plush and everything went smoothly~~ Thank you so much! Positive feedback from hawlucha on Mon, 16 Sep 2013 12:23:11 -0500: I participated in a GA with latias_latios_7. Positive feedback from sorjei on Sat, 14 Sep 2013 12:20:00 -0500: I sold to latias_latios_7. Positive feedback from kirstingent on Thu, 5 Sep 2013 17:33:59 -0500: I bought from latias_latios_7. Bought Vulpix & Ninetales perler bead sprites. Kept me up dated on completion and shipping. Arrived fast. THEYRE AMAZING. Awesome seller, awesome member. No issues. :) Thank you!!!! Positive feedback from denkimouse on Sat, 31 Aug 2013 17:47:00 -0500: I sold to latias_latios_7. Positive feedback from acidmimi on Fri, 30 Aug 2013 03:45:39 -0500: I sold to latias_latios_7. Positive feedback from happycharmander on Sun, 25 Aug 2013 12:47:09 -0500 for this transaction: I sold to latias_latios_7. Great communication and super fast payment! Pleasure to do business with and welcome back anytime! Positive feedback from mandysaurus_rex on Sun, 18 Aug 2013 18:32:17 -0500: I participated in a GA with latias_latios_7. They bought eeveelution zukans from the 16th movie set! Paid quickly, and friendly as always! Positive feedback from hebilea on Sat, 17 Aug 2013 02:37:17 -0500: I sold to latias_latios_7. Positive feedback from sannndi on Thu, 15 Aug 2013 17:05:09 -0500: I participated in a GA with latias_latios_7. Positive feedback from aceattorneygirl on Thu, 15 Aug 2013 07:31:30 -0500 for this transaction: I bought from latias_latios_7. I commissioned 2 Torchic Perler Bead Sprites from this user. Positive feedback from tryndamere on Thu, 8 Aug 2013 13:33:03 -0500 for this transaction: I sold to latias_latios_7. Positive feedback from agui_chan on Tue, 6 Aug 2013 15:13:32 -0500 for this transaction: I sold to latias_latios_7. I sold a Jolteon Kyun Chara. Positive feedback from ichigobekon on Tue, 6 Aug 2013 14:05:13 -0500: I sold to latias_latios_7. I sold several figures to them! They were very friendly and fast payment as well! :) Thanks!! Positive feedback from acciolucius on Tue, 30 Jul 2013 21:34:09 -0500: I sold to latias_latios_7. Positive feedback from rypeltajaroll on Tue, 30 Jul 2013 19:02:23 -0500 for this transaction: I sold to latias_latios_7. Thanks for the quick payment + pleasant transaction overall! Positive feedback from sannndi on Wed, 24 Jul 2013 16:33:30 -0500: I sold to latias_latios_7. I sold tepig pokedoll to this member. Paid promptly, polite and kept me updated with arrival. Great buyer, Welcome back anytime. Positive feedback from reimu on Mon, 22 Jul 2013 20:25:05 -0500: I sold to latias_latios_7. Paid quickly and very friendly, good buyer and would be happy to do business with them anytime! Positive feedback from mintmittins on Wed, 17 Jul 2013 23:42:19 -0500 for this transaction: I sold to latias_latios_7. Sold a Kyogre plush. Would sell to again, no problems. Thanks! Positive feedback from mousealchemist on Thu, 11 Jul 2013 20:17:34 -0500: I sold to latias_latios_7. Positive feedback from skdarkdragon on Thu, 11 Jul 2013 13:43:25 -0500: I sold to latias_latios_7. Positive feedback from mintmittins on Tue, 25 Jun 2013 23:29:00 -0500 for this transaction: I sold to latias_latios_7. They bought a sticker from my sales. Paid promptly, no problems. Happy to do business with again! Thank you! Positive feedback from mintmittins on Tue, 25 Jun 2013 23:20:10 -0500 for this transaction: I sold to latias_latios_7. They bought some Pokedolls from my Nintendo World pickup. Paid promptly, no problems. Happy to do business with again! Positive feedback from suzanneespeon on Tue, 25 Jun 2013 02:26:35 -0500: I sold to latias_latios_7. I sold some figures to this user. Quick response and very friendly. Positive feedback from tofu256 on Sat, 22 Jun 2013 02:31:36 -0500: I sold to latias_latios_7. sold a N clearfile and keychain, buyer was friendly and payment sent prompty, thank you! Positive feedback from shirohikarikaze on Fri, 21 Jun 2013 14:57:55 -0500: I sold to latias_latios_7. Sold Whimsicott, Togepi and Zubat plush. Friendly, great communication and fast payment! Welcome back anytime! :) Thanks! Positive feedback from kyra_midnight on Sat, 15 Jun 2013 11:42:26 -0500: I sold to latias_latios_7. Positive feedback from shiny_vulpix on Sat, 20 Apr 2013 16:45:14 -0500: I sold to latias_latios_7. Paid promptly, great buyer :D Thank you! Positive feedback from kyogres on Thu, 18 Apr 2013 21:56:25 -0500: I sold to latias_latios_7. Fast payment and good communication. Would gladly sell to again. Positive feedback from frugrow on Thu, 18 Apr 2013 19:53:19 -0500: I sold to latias_latios_7. I sold the Phantom + Chatot zukan to latias_latios_7. Quick payment and very friendly! Positive feedback from __sasami__ on Wed, 17 Apr 2013 21:30:47 -0500: I sold to latias_latios_7. Positive feedback from bladespark on Sun, 14 Apr 2013 14:28:26 -0500: I sold to latias_latios_7. Was commissioned for a mini ferret. :3 Great transaction all around. Positive feedback from jujufox on Sun, 7 Apr 2013 20:54:55 -0500: I sold to latias_latios_7. They ordered a few custom amigurumi from me. Payment was prompt and always a pleasure to do business with. Positive feedback from pogaf on Sun, 31 Mar 2013 13:49:19 -0500 for this transaction: I sold to latias_latios_7. Buyer had fantastic communication and paid promptly. Absolutely no problems- would happily work with again! Positive feedback from o0vailo0o on Mon, 18 Mar 2013 15:07:28 -0500: I participated in a GA with latias_latios_7. A pleasant buyer~ Welcome back any time. Positive feedback from nameless5555 on Sun, 17 Mar 2013 01:55:29 -0500: I sold to latias_latios_7. Positive feedback from hebitheivan on Fri, 8 Feb 2013 08:07:29 -0600: I sold to latias_latios_7. Positive feedback from jujufox on Thu, 7 Feb 2013 17:44:01 -0600: I sold to latias_latios_7. They bought something from my Etsy shop. Payment was fast and they were a pleasure to work with. Positive feedback from mandysaurus_rex on Mon, 4 Feb 2013 14:59:47 -0600: I participated in a GA with latias_latios_7. They paid quickly, good communication. Thanks! Positive feedback from tofu256 on Sun, 3 Feb 2013 17:38:55 -0600: I sold to latias_latios_7. sold them a set of badges and a card sleeve, smooth transaction, great buyer, thank you! Positive feedback from abbeymew on Sun, 3 Feb 2013 11:53:10 -0600: I sold to latias_latios_7. Positive feedback from cyritic on Sun, 9 Dec 2012 13:35:38 -0600: I sold to latias_latios_7. Promt payment excellent communication friendly buyer thank you!! Positive feedback from jirachi76 on Sun, 9 Dec 2012 13:25:28 -0600: I sold to latias_latios_7. Positive feedback from tsuiling on Tue, 27 Nov 2012 20:10:46 -0600: I sold to latias_latios_7. Glaceon Pokedoll from pickups. Nice buyer, good communication, and quick payment. Positive feedback from ladylale on Tue, 9 Oct 2012 03:24:00 -0500 for this transaction: I participated in a GA with latias_latios_7. Overall very well communicator, which is always appreciated in a buyer. Would highly recommend this person to do business with! Thanks again! Positive feedback from rhys107 on Wed, 12 Sep 2012 13:02:38 -0500: I sold to latias_latios_7. Feraligatr, Brendan, and Uxie figures! Positive feedback from allinia on Tue, 11 Sep 2012 20:51:47 -0500 for this transaction: I sold to latias_latios_7.